Where are the rest of the Engineers? 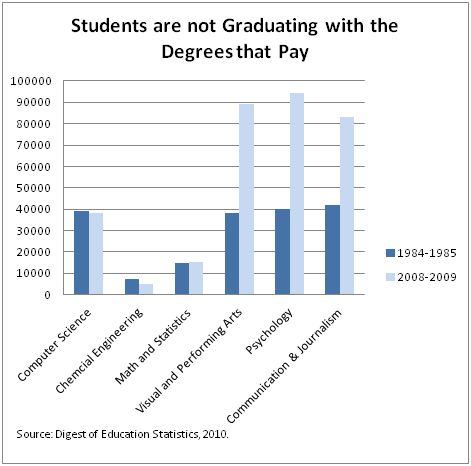 It's tough to find good Industrial Engineer grads. I'd like to see how they cross-promote Tabarrok's book, Launching the Innovation Renaissance with his co-blogger, Tyler Cowen's book The Great Stagnation: How America Ate All the Low-Hanging Fruit of Modern History, Got Sick, and Will(Eventually) Feel Better. According to Cowen, there hasn't been anything innovative since the early 70s and that's why wages went stagnant. He's the reason I don't bother reading Marginal Revolution anymore. Maybe they need a Tabarrok only section. Perhaps it is easier to get through college in majors where answers are subjective. Getting through college is all you need to do, right? The 2000's were also the peak years of 17-18 year old US population so the absolute numbers of psych majors may not be strictly comparable (although the tech fields seem somewhat constant). More importantly the psych/performing arts/communications majors are often the place people with no real strong interests end up. Interestingly the fine arts (music, art) when done well are very demanding. I have a friend who is a physicist turned music professor and one of his courses is how to make a living as musician. Successful musicians have several jobs (teaching, performing). I think one solution that can be done immediately is to eliminate the undeclared major. I think that even if you change majors later, you benefit from the structure imposed by the major. Coupled with a rigorous core curriculum (and stripped of diversity/international requirements) this would help create a greater seriousness in higher ed. >>> Getting through college is all you need to do, right? It's worth a hell of a lot more than 20-30 years of constantly updated experience, I can tell you that. >>> I think one solution that can be done immediately is to eliminate the undeclared major. I think that even if you change majors later, you benefit from the structure imposed by the major. One of the biggest problems is the tp-roll educational system, which treats Diplomas as though they were supposed to be pulled off of a roll of TP. The result is good for about the same thing, and not much more. I started as a Physics/Math major and switched to an IT/Math major because I found I had no love for modern (post-Einstein) physics. I did that halfway through my sophomore year, because I'd taken 1 physics course each term, and found by the 4th-odd one that I didn't like it any more. In addition, not being in the 2y-4y schedule, I could take courses at the borders of my degree interests that gave me a much wider breadth of understanding of my own fields of interest, courses that have done me well in workplace environments. Moreover, it allowed me to make use of the vast computing resources of the university environment to learn an awful lot of stuff that there were no courses for. If you're interested in something, you can find out who is the local "expert" in it and find some job for yourself or permission to access the resources involved so that you can learn on your own time. I had a friend who graduated HS a year ahead of me. I went up to see him between my sophomore and his junior years (we attended different colleges -- his was nominally more prestigious than mine). I knew so much more about computers than he did it wasn't funny, and he would never, ever have been able to catch up, because a lot of what I learned I learned OUTSIDE of class, because I had time to explore and "play" with computers. Moreover, under 2y-4y, if you're taking one of the hard majors, you cannot leaven your schedule with easy courses from outside your major at the same time as you take 1-2 of the really hard courses, such as P-Chem for the chemistry majors. I ALWAYS did this. Once more, it allowed me much more time to explore my majors -- both Math and IT -- than any system without such leavening would have presented. These three elements -- Block, 2y-4y, and "zero leavening" -- make for sucky graduates taking crappy degrees. This subject was discussed recently on The Volokh Conspiracy. One reason mentioned was that people who want to enter post-grad professional programs (MBA, MD, etc) find themselves in grade competition with the soft subject majors. You can be top-of-the-curve in those subjects if you are a mediocre student in the technical subjects. A relative went to Johns Hopkins undergrad with an eye on medical school. JHU is a top-ranked school which picks students from a world-wide talent pool (thus Asians made up the bulk of this major. She was advised to drop her highly technical biological major (directly relevant to med school) and take one of the easy subjects. She was also told that it would have been better for her (or anyone) to go to an easier, lower quality school. So we have a system which is very poor at measuring merit. This subject comes up repeatedly. Why do young people study snap courses which result in an economically useless degree? We all have friends and relatives who have gone this route to their sorrow. An amusing anecdote on the subject of snap courses. My mother had a friend who bragged about her daughter who was a 3.75 student at the university. My grades were much lower (Ch.E. student). My mother was a bit mortified about the comparison. It turned out that the girl was majoring in International Studies, where the dept. ave. grade was 3.75. In engine school, the ave. was 2.1. I pointed all this out and my mother had the last word with the other lady. If you want high grades with no employment possibilities, by all means take snap courses. If you do, don't complain that an engineer makes more money than you do! >>>>>It’s worth a hell of a lot more than 20-30 years of constantly updated experience, I can tell you that. "Moreover, under 2y-4y, if you’re taking one of the hard majors, you cannot leaven your schedule with easy courses from outside your major at the same time as you take 1-2 of the really hard courses, such as P-Chem for the chemistry majors. I ALWAYS did this." My college was designed like this from the day you walked in the doors. They knew they had lots of bright kids interested in engineering and science who would walk away if they were forced to take 2 years of irrelevant stuff before hand, and the crush of 2 solid years of nothing but engineering classes would eliminate the rest. They also knew they had a bunch of kids who were interested in some kind of technical major, be it engineering, computer science, or the "hard" sciences but hadn't been exposed to specifics of any of them, so they forced us to take a smattering of them all early. I'm glad they did it that way. I started as Undecided Engineering, leading toward Nuclear Engineering, and after suffering through physics and chemistry, realized that I hated things like thermodynamic calculations, which would probably be where much of my education would be if I went down the NucE path. But I really liked my programming class, even though they had forced me to take a very outdated language (many MechE/NucE/AeroE applications are written in Fortran due to its superior numerical performance, but it's still the oldest non-assembly programming language out there). So that was the end of my engineering status and why I switched to Computer Science, and never looked back. If I had had to take 2 solid years of CompSci classes at the end I would have died. Classes with significant programming assignments look all innocent at 3 credit hours apiece. Then you spend 20 hours a week pulling your hair out because your assignment doesn't work. Oops, there goes the "2.5-3 hours outside class for every hour in class" guideline. Nobody has mentioned that we subsidize those worthless degrees w/ tax dollars. That ticks me off too. Most public universities were established with the explicit contractual agreement that they were to aid the needs of the local/regional economy. That's why they were A&M (as were most land grants), normal schools, or outright Tech schools. Teaching Marxism, Ancient Mayan poetry, Womyn's Studies, etc, is not appropriate. If private colleges/universities want to offer such degrees, more power to them. But it's outright breach of contract for state universities to do so. How in the hell did we get to a state where everyone is studying "underwater basket weaving" instead of science, engineering, accounting and other economically viable subjects? So few are studying engineering that all sorts of foreigners are being imported to fill the jobs. Most of engineering grad students nowadays are foreigners. Somewhere along the line, the word got out that a degree is a degree is a degree, no matter what the subject being studied. The profs will not clue in the students. Who will tell students not to study in their department because it is financially a waste of time? The profs are necessarily self-serving in this regard. They won't shut down their own department. Where are the parents? If your kid is off to college to study poli sci or some such, why aren't you explaining the economic realities to him? If he winds up after four years or more working at McD's, whose fault is that? You will have a thoroughly disillutioned offspring who hates the system. If you argue tht everyone can't be a scientist, engineer, or accountant, then isn't it better to be a plumber or electrician rather that a college graduate selling perfume in a department store? Somewhere along the line, the word got out that a degree is a degree is a degree, no matter what the subject being studied. You'll also see stats thrown around that say a college degree will result in average additional earnings of $X over a lifetime. Those remarks never come with a discussion of causation vs. correlation nor do they mention that this average is a mean and includes some very high numbers indeed for certain major areas and some very low numbers for others. To the matter of why so few people study engineering and math, I think this is a part of it. If the difference in payoff is minimal, why bother with a "harder" subject? OTOH, there is another problem which is that the culture of mathematics is, or at least was, macho to the point of dysfunction. I'm a bearded, deer hunting, Hemingway reading, beer drinking male and it was too much football locker room crossed with military basic training for me to stomach. I can hardly imagine what it must be like for women. That alone might be enough since Math is the central requirement of all of these "stem" subjects, but judging by the engineering students I used to know it doesn't stop there and continues right on through the curriculum. Send the drill instructors over to the ROTC office and get some real teachers in the math classes and you'll see things improve.